God has already given the most earthshaking sign when the Word was made flesh. To ask for another is to already mock God. No other sign is necessary. It is now the time for faith. 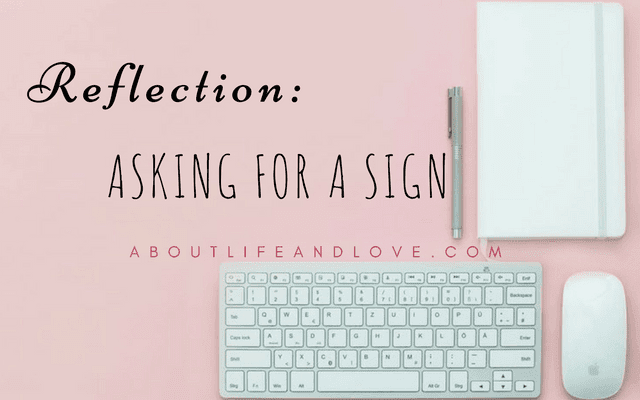 Have you been in a desperate situation where you have to ask God for a sign? I have. I can't remember anymore what it was and what sign I asked for, but I did. It was hearing the stories of people asking God for a sign and receiving it that inspired me to do it. Or maybe the desperation for knowing the answer to my prayers ASAP. Is asking for a sign a lack of faith? Why do some people do it? I asked God for a sign not because I want to test God but because I was impatient for the answer. Human as I am I want to see for myself the confirmation from Him. Late have I realized that asking God for sending me a sign was a sign of my lack of faith. If I believe with all my heart that He will answer my prayer, all I need is patiently wait for His answer to come to pass. If at the end of my prayer I say, "I claim this with faith in Jesus' name", why do I insist He shows me proof first? God answers prayers in three ways: yes, no, wait. God's timeline is different from ours. We may be waiting for years for him to answer our prayer, but that does not mean He's late. It does not mean that He's sadistic and takes delight in watching His children cry in desperation. He is an all-knowing God. He sees everything even the things that are yet to happen. So if He answers a prayer today He knows whether it will make you better or if it will worsen the situation. In the years that I prayed to God, I realized what He has prepared for me is much MUCH better than what I've been praying for. Always. Truly when you wait in the Lord, He does not disappoint. In fact He will blow your mind with how great His surprise is. It will happen so fast you'll be wondering why you were worried before, or why you even burdened yourself with misery when you know from the very start that with God nothing is impossible. He can part the ocean to deliver His people from their enemies. He can slay a giant with just a stone and a sling. He can turn water into wine. He can make the childless bear children as many as the stars. Even when they're already past the childbearing stage. He can raise the dead to life. He has overcome the grave Himself. What other sign are you asking for? A white rose? A butterfly? A rainbow? Don't they pale in comparison to how great the things God has done in the past and how great He still is today? Hey, maybe you reading this post is a sign that you should stop asking for a sign and trust God instead? What do you think? Hi Lux! I also ask for signs from the Lord, or a clear message that what I'm doing is right, or that I'm on the right track. I suppose it is lack of faith, because if I had all the trust in the world in him, I would know it'd all turn out well. I doubt I'll stop asking, but maybe I'll be more patient with the answers. I like how you said God will blow my mind with his answers. I'd like that! I don't necessarily believe in God - it's not something I'm public about. I think it's a very personal and fluid matter. I have close loved ones who are Atheistic or Agnostic (I support and relate to them a lot more than Bible thumpers). However, I believe there are always signs, especially when we're open to seeing them. Have a great week, Lux. Never been one to just ask for a sign at my sea, just keep on keeping on and let them come to be. I may not be the holiest grain, but I am definitely god centered. Lux I agree with His answering prayers. He has answered so many and I've seen miracles from praying for healing of a grandson's disease (impossible but not with God), and prayed for grand babies when it was impossible with infertility but He has answered over and over and over.